"Hellboy" was born — or launched onto the Earth — 25 years ago, the result of Mike Mignola's significant imagination. In creating the character and story for Milwaukie's Dark Horse Comics, Mignola wasn't planning on immense success, which in subsequent years has spawned several more graphic novels, including a 25th-anniversary publication for the upcoming Hellboy Day, and two movies starring Ron Perlman, and a third on the way with David Harbour in the lead role. "I certainly never imagined when I started 'Hellboy' that it would still be going," the Los Angeles-based Mignola says. "I didn't know. I hoped it would catch on but, really, I just did it for myself. There was no attempt, really, to create a character I thought would be commercial. I just put all the stuff I liked into it and hoped for the best." Mignola, Dark Horse and fans around the world celebrate the character on Saturday, March 23, the official Hellboy Day. 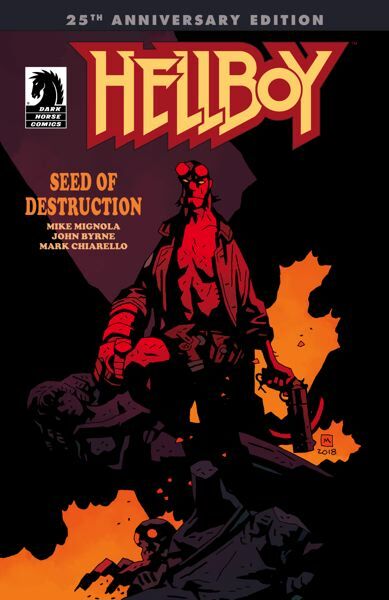 Dark Horse published the debut issue of "Hellboy: Seed of Destruction" in 1994, introducing comic book readers to the Right Hand of Doom, the Bureau for Paranormal Research and Defense, and the iconic character himself, Hellboy. For Hellboy Day, Dark Horse will publish a 25th anniversary, promotional edition of "Hellboy: Seed of Destruction, Issue 1," featuring a new cover by Mignola and colorist Dave Stewart. It'll be given away at participating comic book shops and select stores. In the Portland area, the celebration will be at Things From Another World, 2916 N.E. Broadway, from 1-4 p.m. Saturday, March 23. There'll be Hellboy Day signings with writers and artists — Chris Roberson, Tyler Crook, Michael Avon Oeming — and beer and cake. (Mignola will appear at a Hellboy Day signing at Earth 2 Comics in Sherman Oaks, California that day). There's 50 percent off digital "Hellboy" comics at darkhorse.com. In addition, Dark Horse has created a series of Hellboy Day promotional materials for retailers and fans. Some of the best known novels of the Mignolaverse, in which the Hellboy character has appeared: "Hellboy & the B.P.R.D.," "Abe Sapien," "B.P.R.D.," "Crimson Lotus," "Frankenstein Underground," "Lobster Johnson," "The Visitor: How and Why He Stayed" and "Witchfinder." Mignola says he's grateful for writers, artists, colorists and letterers who've helped him with "Hellboy" throughout the years, as well as fans. "This thing could not exist without their support and it's a pleasure every time I get to go out to meet them," he says of fans. 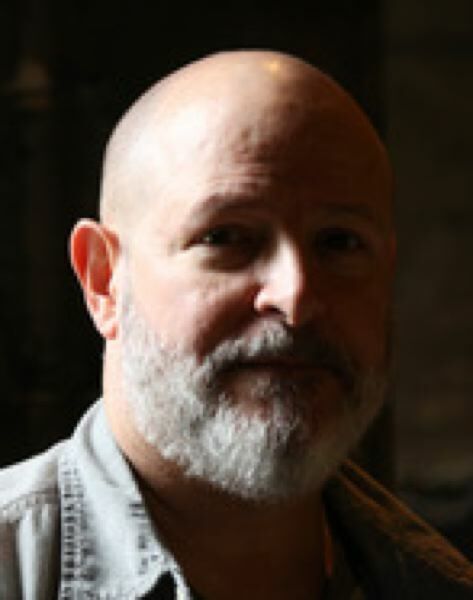 Mignola, who started working at Marvel in 1982, was just being himself when he developed the Hellboy character in the early 1990s, and then watched as it became a published entity in 1994. "I have always loved monsters and wanted to do a book about a guy who investigates supernatural stuff," he says. "I figured if the main character was a monster himself, I'd have a book where I was pretty much drawing monsters all the time." Despite his name, Hellboy is a half-demon superhero and a good guy who has a real name, Anung Un Rama, or "and upon his brow is set a crown of flame." He works for the Bureau for Paranormal Research and Defense (B.P.R.D.) and hunts Nazis, witches and the like. Perlman starred as Hellboy in two films — and there have been two straight-to-DVD animated films and three video games made. A third film, by Neil Marshall and starring Harbour, comes out this year, set to be released April 12. Perlman reportedly wasn't interested in being in the third movie because it didn't involved director Guillermo del Toro. "Ron was great. And David Harbour is great," Mignola says. "They both bring a different spin to the character. Neither is exactly the character in the comic, but both kept true to the spirit of the character that I created." He's proud of his "Hellboy" work. "'Hellboy' is what I will be known for and I'm very proud of it," Mignola adds. "Proud of the work I've done, proud of the people I've gotten to work with, and proud of the world that I've created that continues to grow."